How Did an Ancient Egyptian Symbol Influence It? The Coptic cross is a symbol of Coptic Christianity, the primary denomination of Egyptian Christians today. The cross comes in a number of different forms, some of which are obviously influenced by the older, pagan ankh symbol of eternal life. Coptic Christianity developed in Egypt under Saint Mark, writer of the Gospel of Mark. The Copts became separated from mainstream Christianity at the Council of Chalcedon in 451 CE over theological differences. Egypt was then conquered by Muslim Arabs in the 7th century. The result is that Coptic Christianity developed largely independently of other Christian communities, developing their own beliefs and practices. The church is officially known as the Coptic Orthodox Church of Alexandria and is led by its own pope. In the last few decades, the Coptic and Greek Orthodox churches have reached agreement on a variety of matters, including recognizing each others' marriages and baptisms as legitimate sacraments. Early versions of the Coptic cross was a fusion of the Orthodox Christian cross and pagan Egyptian ankh. The Orthodox cross has three cross beams, one for arms, a second, sloped one for the feet, and a third at the time for the INRI label placed above Jesus's head. The early Coptic cross is missing the foot beam but includes a circle around the upper beam. The result from a pagan perspective is an ankh with an equal-armed cross inside the loop. For Copts, the circle is a halo representing divinity and resurrection. Halos or sunbursts with similar meaning are also sometimes found on orthodox crosses. The pagan Egyptian ankh was a symbol of eternal life. Specifically, it was the eternal life granted by the gods. In images the ankh is commonly held by a god, sometimes offering it to the nose and mouth of the deceased to grant the breath of life. Other images have streams of ankhs poured over pharaohs. Thus, it is not an unlikely symbol of resurrection for early Egyptian Christians. Some Coptic organizations continue to utilize the ankh without modifications. One example is the United Copts of Great Britain, which use an ankh and a pair of lotus flowers as their website logo. The lotus flower was another important symbol in pagan Egypt, relating to creation and resurrection because of the way they appear to emerge from water in the morning and descend in the evening. 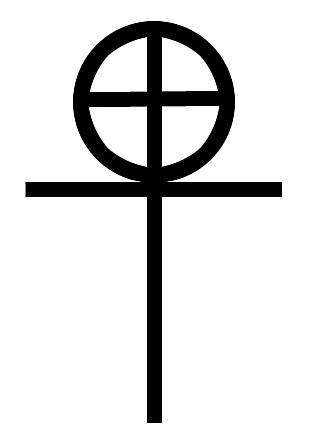 The American Coptic website bears an equal-armed cross set within what is clearly an ankh. A sunrise is set behind the symbol, another reference to resurrection. Today, the most common form of Coptic cross is an equal-armed cross which may or may not incorporate a circle behind it or at its center. Each arm often ends with three points representing the Trinity, although this is not a requirement.